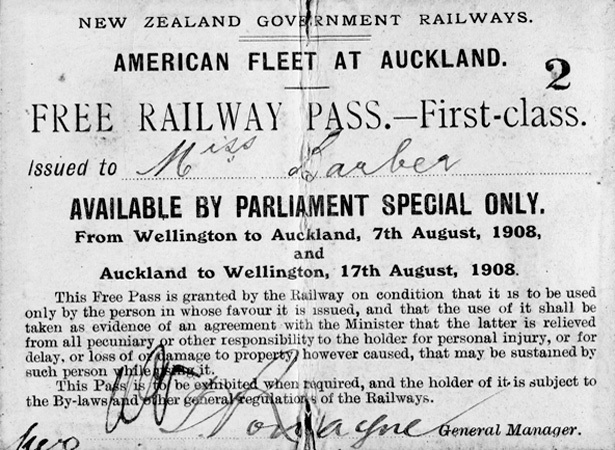 The first train to travel the length of the North Island main trunk line, the ‘Parliament Special’ left Wellington on the evening of 7 August. On board were Prime Minister Sir Joseph Ward and other members of Parliament heading to Auckland to greet the American navy’s ‘Great White Fleet’. The train travelled over a temporary, unballasted track in the central section of the still-unfinished main trunk line. It was hauled in turn by locomotives from the Wellington & Manawatu Railway Company, New Zealand Railways, the Public Works Department and New Zealand Railways again. The trip took 20½ hours. The main trunk line was not formally opened until 6 November, when Ward drove home a final polished silver spike at Manganuioteao, near Erua. Regular services began soon after, and an express train introduced in February 1909 made the trip in 18 hours. We have 7 biographies, 8 articles, related to First train runs length of main trunk line.